Clinton Foundation in New York City. 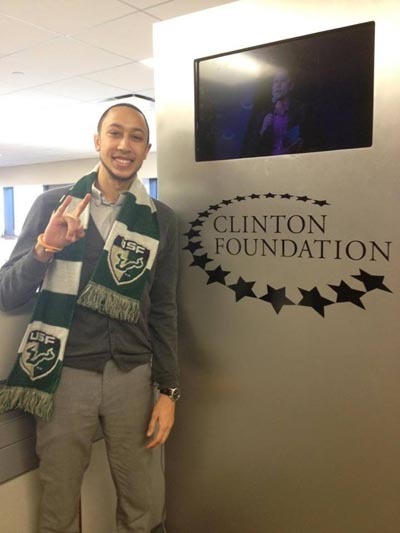 TAMPA, Fla. –- University of South Florida College of Arts and Sciences alumnus Dominique Benjamin landed an internship at the Bill, Hillary and Chelsea Clinton Foundation in New York City. Benjamin works for the foundation’s childhood obesity initiative, the Alliance for a Healthier Generation. Benjamin said he didn’t expect to get the position at all. Benjamin, a 2013 graduate of the School of Mass Communications, was offered the job with the alliance’s marketing and communications team a week after his graduation. His responsibilities include creating digital content, working on social media strategies and assisting with marketing initiatives to increase awareness of the organization. Benjamin said being an intern in the Dean’s Office Internship Program for the College of Arts and Sciences was the most valuable experience he had in college. Benjamin’s favorite thing about the Clinton Foundation is getting to work along side experts from different fields. Everyone has an interesting story behind how they got there, he said. Thanks to the Clinton Foundation and their involvement with several other organizations, including non-governmental organizations, Benjamin has a better idea of where he will want to work when the internship ends.